115 specialists in the meetings market received updates on the Destination in Mexico City; the Riviera Nayarit hosted 491 meetings and events in 2014; 54% of all the visitors to the Destination last year were from the domestic market. The Riviera Nayarit Convention and Visitors Bureau’s Promotions and Sales Department and hotel representatives from the destination’s hotels carried out MICE events (Meetings, Incentives, Conferencing & Exhibitions) and training workshops in Mexico City, strengthening meeting planners’ focus on the Riviera Nayarit. The work, which took place during the fourth week of April, was directed towards these agents that in meetings, conventions, expos, weddings and fairs. There were 491 events of this type hosted in the Destination last year, 230 of which were organized by national companies. The first stop was Eventos MICE DF. 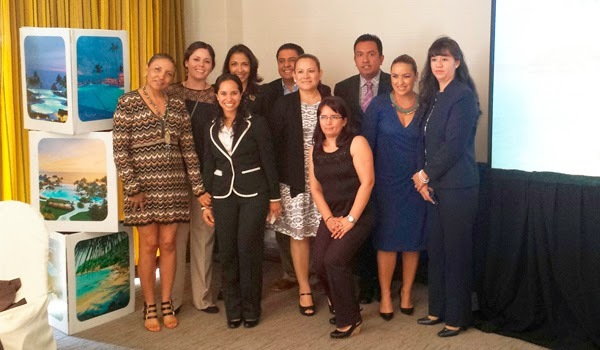 The Riviera Nayarit hosted a breakfast for 50 meeting planners; besides the keynote address by the CVB, there were also round tables offering information from the Destination’s hotels. The workshops for the incentive agencies consisted in visiting some of the top companies including Groups To Go, American Express, Koch Overseas, Innova, CTS, among others. The hotel representatives updated the firms, and they also opened negotiations to eventually bring more groups to the Riviera Nayarit in the near future. A full 56.4% of the tourists that arrived in 2014 were domestic visitors. The meetings and events segment attracted 97,286 visitors to the destination last year. The Riviera Nayarit CVB’s official Poll provided the statistics and data for this article.